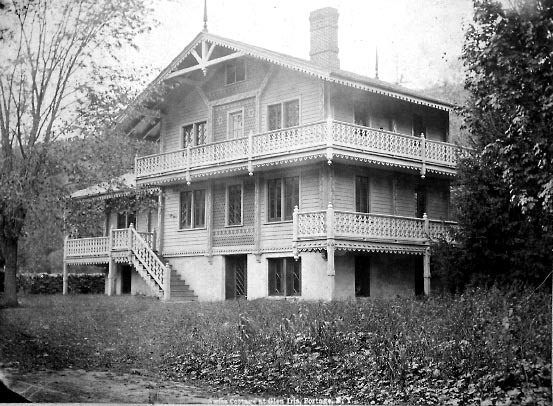 "Swiss Cottage at Glen Iris, Portage NY"
At one time there were two "Swiss Cottages" on the Glen Iris Estate - the caretaker's cottage at the Council Grounds and Lauterbrunnen, situated at the top of Eagle Hill. It is thought that this image may be of the Swiss Cottage that was originally built by Mr. Letchworth on the flats near the river in the 1870s, and then moved to the Council Grounds to serve as the caretaker's cottage. See Image 131 for images of Lauterbrunnen.